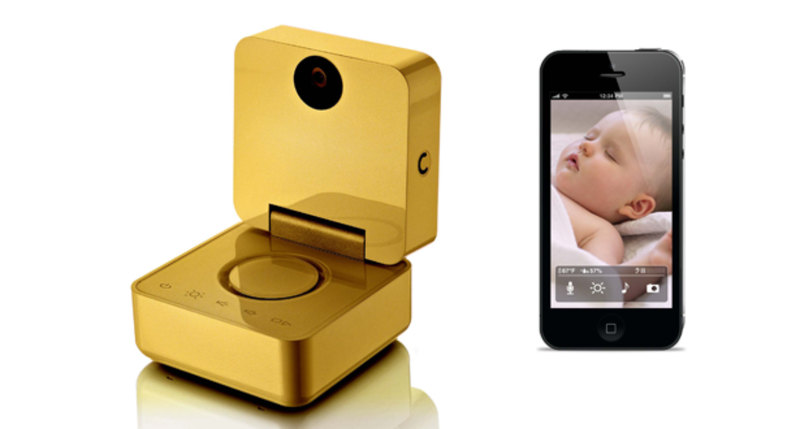 To celebrate the arrival of the royal baby, one the world's leading connected health companies has created a nursery product fit for royalty - the world's most expensive high definition baby monitor. Worth approximately £35,000 and expertly plated in 24 carat gold, just one of the monitors has been exclusively produced for the royal couple. The baby monitor is a limited edition remodeling of Withings' popular Smart Baby Monitor, which allows parents to see and hear their children in high definition directly on their smartphones. Whether at home in the £4.85m Berkshire manor where the baby will spend its first six weeks or abroad, the pair can keep an eye on and interact with their new arrival at all times using mobile or tablet devices. Engineers have spent nearly two months designing and developing the commemorative monitor, creating the perfect functional ornament to celebrate the arrival of the third in line to the throne. The luxurious monitor, enabling the new parents to see and hear their baby wherever they are, will be sent to the couple as an exclusive gift to celebrate the highly anticipated birth. For non-royals, the HD Smart Baby Monitor is available in Apple Stores nationwide for £239.95 and can be bought through Withings' website: http://www.withings.com/babymonitor. The Smart Baby Monitor, with its night vision capable high-resolution video, enables two-way communication between parents and their babies, giving users total control through their Smartphone or tablet. Parents can talk to their baby through paired iOS or Android devices to sooth, play lullabies and even control a multi-coloured calming nightlight. Alerts can be created to monitor noise, motion, temperature and humidity in the baby's room. Minh Le, Chief Marketing Officer at Withings, said: "As the most high profile royal birth in recent memory, only the best will do for the third in line to the throne and our engineers have been working hard to create something that is both functional and beautiful. We hope this luxurious monitor puts the new parents' minds to rest as it will enable them to monitor their baby's wellbeing wherever they are, whether at home or abroad."